The contamination in groundwater due to the presence of uranium is nowadays a subject of concern due to the severe health problems associated with renal failure, genotoxicity and cancer. The standard methods to detect uranium require time-consuming processes and expensive non-portable equipment, so these measurements are rarely performed in-field, which increases the time until water samples are analysed. Furthermore, the few portable methods available do not allow quantitative analysis and the detection limit is often not low enough to reach the recommendations for drinking water (30 ppb or 126 nM of uranium). 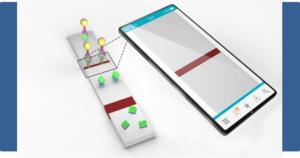 For the first time, we propose a portable, fast, inexpensive and sensitive paper-based biosensor able to detect in situ U(VI) in water samples: U(VI) selective gold nanoparticle-based lateral flow strips. Antibody-coated gold nanoparticles are used as labels in the proposed lateral flow system because of their biocompatibility; in addition, these nanoparticles provide high sensitivity due to their intense plasmonic effect. The antibody used in the assay recognizes soluble U(VI) complexed to the chelator, 2,9-dicarboxyl-1,10-phenanthroline (DCP). Because of the small size of the U(VI)-DCP complex, this assay employs a competitive format that reaches a limit of detection of 36.38 nM, lower than the action level (126 nM) established by the World Health Organization and the U.S. Environmental Protection Agency for drinking waters.